Aston Merrygold has revealed his JLS bandmates are getting jealous of his boozy ways. While Aston is out enjoying parties and nights out, his bandmates Marvin Humes and Jonathan JB Gill spend their free time at home with their girlfriends. 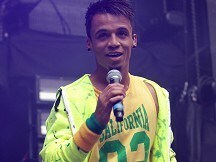 Aston told the Daily Star: "I don't get jealous of the other boys. When they're in their flats watching a DVD and I'm out partying and getting drunk, they get a bit jealous of me." But Aston did admit that although he was loving being a single man about town, he wouldn't mind the kind of domestic bliss enjoyed by Marvin and his girlfriend, Saturdays singer Rochelle Wiseman. He said: "I'm not looking for anything long term but if it came along I'd be very happy. "I'm very confident I'd make a good boyfriend. I know I have a hectic lifestyle but I would always make time for my girlfriend no matter how busy I was." Chart-topping star Jessie J leads the field at this year's Mobo Awards - and said her five nominations were "amazing". Rapper TI has been released from prison in the US a month early after serving a weapons violation sentence. JLS have revealed it is "a dream come true" to be performing in the upcoming Michael Jackson tribute concert this autumn. Peter Andre and the Sugababes are among the stars who will be taking a bow in hit West End musicals for BBC Children In Need. Boyz II Men plan to celebrate their 20th anniversary in music with a special performance at this year's Mobo Awards. Beyonce's pregnant performance at the MTV Video Music Awards has sparked a Twitter record.When the 29-year-old star performed, there were 8,868 tweets per second. Teen heart-throb Justin Bieber and his Ferrari were both said to be fine after a prang in Los Angeles. Professor Green may be moving into the girl band sector - as a songwriter.The rapper told the Daily Star that he'd like to write for bands whose music he currently doesn't rate.